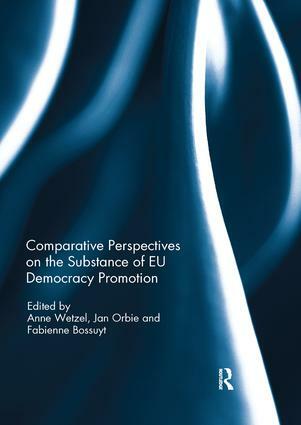 This book examines the substance of European Union (EU) democracy promotion by comparing it with norms of governance that other international actors promote, among them the United Nations, the United States, the Central and East European EU member states, Russia, China and non-governmental organizations. It aims is to gain a better understanding of the EU’s democracy promotion agenda and to learn more about the (in)distinctiveness of the norms diffused by the EU. Building on a common conceptual chapter, the contributions follow different theoretical approaches and research designs, and focus on a diversity of case studies. The book concludes that in comparison with other international actors, the EU’s conceptual approach to democracy promotion is diffuse, which in turn makes the EU a particularly flexible but also ‘technical’ democracy promoter when it comes to implementation. At the same time, there are limits to flexibility at the level of concepts and frames. This indicates a distinct character of the substance of EU democracy promotion, which can be linked to the nature of the EU polity. This book was published as a special issue of the Cambridge Review of International Affairs.